Hi, One of the mods Dean reset my noise margin on the 19/03/12. So does this need doing again or once it is done should it stay like that. Ihave just got home and seen the connectioon dropped about 20 mins ago. It looks like it has changed back to adsl2+. 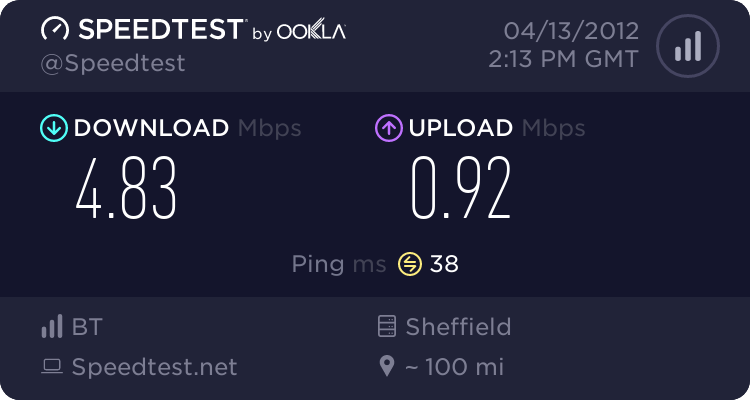 I have seen that the bt speedtester isnt working properly so this is the speedtester.net results. It might be me but if there are 33455 seconds with errors in that would mean over 9 hours worth but the connection time is 18.51 there are only 1131 seconds altogether. Or have I totally misunderstood it. The mods reset my noise margin to 6db on 19/03/12 does that need doing again and if so why doesn't it stay done. At the minute it is showing the longest connection I have seen in a while. Hi, Seems my connection has sorted its self out I am now at over 4 days connected and I have never seen that before so something somewhere has sorted it self out fingers crossed it stays like this. Thanks for all your answers especially John, Keith and Jolly.